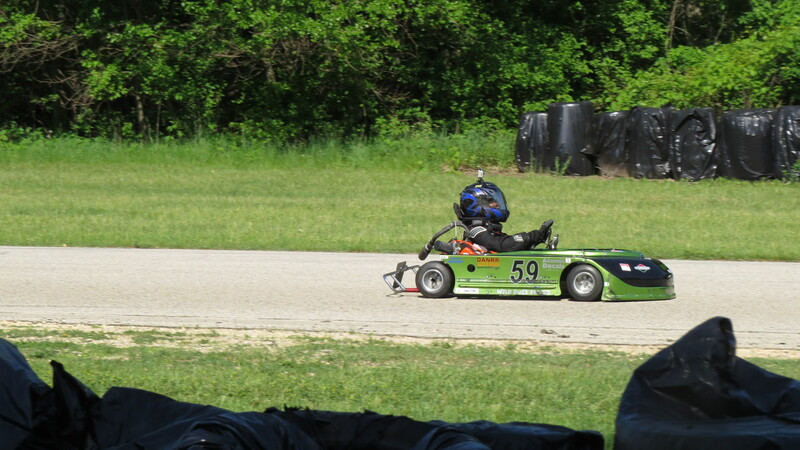 The last weekend in May, we attended the first race in the Championship Enduro Series at Blackhawk Farms Raceway in Rockton, IL. Unlike the sprint races, these races take place on larger tracks that can support cars and motorcycles and are about 2 miles long. In addition to the larger tracks the races are time-based, and the driver with the most laps when they take the checkered flag is the winner. 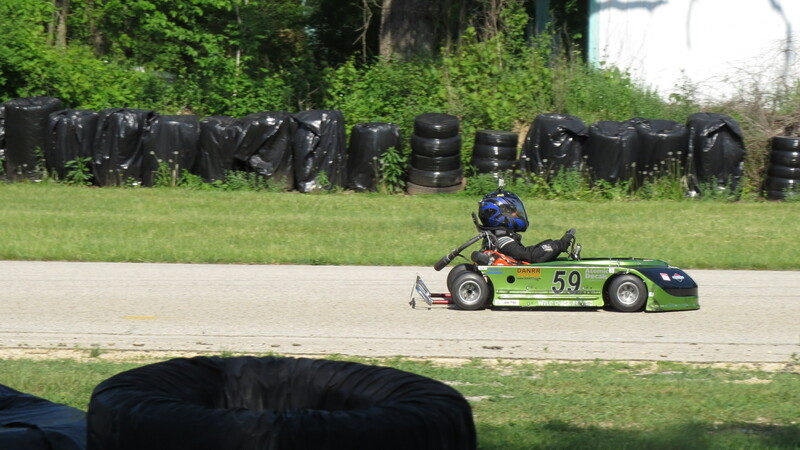 This is Jason’s favorite type of racing as it is very close to racing cars, except that the karts are actually faster. We arrived at the track on Friday night and set up camp for the weekend. The next morning got the kart out and began prepping for the race day. 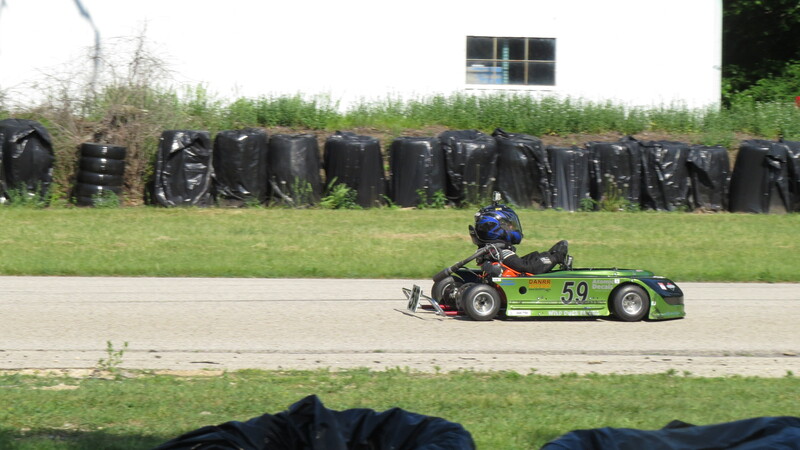 The goal of the morning practice was to get used to the track again and tune the kart for optimal speed. This was the first time we were running the Briggs Animal this year and trying out a new clutch. If we could find the gear ratio that allowed the motor to reach its maximum rpm near the end of the the straights, and still have enough power to quickly accelerate out of the corners, it could be a good day. With a young driver who is still learning this can be a bit of a challenge because you need good feedback, sometimes it’s hard to get that from a 9 year old. Throughout practice, I made gearing adjustments and he kept getting faster, and eventually the rear gear became to small. Since I had limited gears for the new clutch, I decided to go back to an old clutch that had a taller gear on it. Interestingly, this put us back on the same gear configuration we used last year using the LO206 motor. I think, if I had actually looked my notes from last year I should have started there. Starting order for these races is a little weird. The karts are sorted by class and then each class is sorted by who got their entry forms in first. I got those forms in the day they were available, so Jason started first in his class. While practicing, our starter nut was rounded by the 12 point socket on our starter. We had to borrow a friend’s starter and be careful to start the motor the first time, since we did not know if the nut would give out completely. Of course, this made the first race start a little nerve-wracking. We also had not yet really determined it the gas tank held enough methanol for 25 minutes of racing. On the green flag Jason made his usual power start and made his way up to 6th place overall by the first corner. From then on it was the faster karts and drivers making their way around him and Jason lapping some of the slow karts, including a kart with an old Briggs flat head – something you don’t see around much anymore. Jason finished the race in 3rd place in his class and 10th place overall, and had fuel to spare. At then end of the day I was able to get a new starter nut put on the motor which should make Sunday a bit easier and less worrisome. Sunday morning, and frankly the rest of the day, was difficult for everyone. During the 2nd practice session a pair of karts in very fast shifter class touched wheels in the front straight just past the start finish line. One kart tumbled down the rack and the other flipped into the kart rail. The driver of the kart into the kart rail was seriously injured and had to be evacuated by helicopter. At this time the driver is doing OK(click to support) but is going to need to take some time recovering. The safety and flight crews did their jobs with distinction and skill to keep our friends safe and and on their way to recovery. The day’s spirit was a bit dampened by the earlier accident. Some folks even went home, but most stayed. Jason was on the pole for his class, but the motor would not start. After a few attempts, I found the spark plug was still disconnected. It was a quick fix, the kart started up, and off he went, but 30 seconds behind everyone. He caught up to the slower novice class and passed them. Then started working on closest of his rivals. Passed one then another, to fourth place. From there he drove hard to catch up, but with tires still warming he lost some traction in turn 5 and spun loosing more ground and and had to start over again from the back. He made a quick recovery and drove with his heart to try to recover almost impossible ground. Again worked his way back to fourth then on the last lap in the S turn a driver in another class got squirrelly in front of him and he pushed the brakes hard, locking up the read sending him off the track. He tried in vain to drive out of the grass but the kart was stuck and his race was done. That same driver lost control of his kart a few turns later and ended up rolling his kart, again sending out the medics. Saturday’s racing was supported by the Greenwood Restaurant in Glenview, IL. Mike and his staff serve excellent food with a friendly face. The restaurant’s walls are covered with pictures of regular customers including the extended Wild Duck Family. We usually head there for a good luck breakfast before we head to races and then are back again the next day to to show of the trophies. As is tradition after CES races we headed to the Monday Night Car Show at Old Orchard. Lots of very cool cars and people. Jason managed to win a 1956 Chevy bank. Going to this show allows us to give back to the sport and introduce other folks to kart racing. It also lets us promote the folks that help us race with sponsorship. Thanks to Atomic Decals, Danrr Auto Body, GoPro, Amsoil, C&M Auto Service, Stardust Memorials, and of course this week The Greenwood Restaurant. With the accidents this weekend, I want to take a moment to talk about safety of racing. Any sport has risks, just ask the current pro-football players that are suing the NFL. Karting has risks, too. Jason understands this risks and has the equipment and the training to make sure he is a safe driver. Every race starts with a drivers meeting where the rules and safety procedures are covered. The older drivers he runs with keep an eye out the the younger ones and help them understand when they have done something that is dangerous. Everyone, is aware of the inherent risks in motorsports and the do’s and don’ts are give to the kids every race. Our next race will be at Sugar River Raceway on June 8th in their LO206 Junior class. We are waiting to see if we can get the kart set up right and if everyone is rested enough. 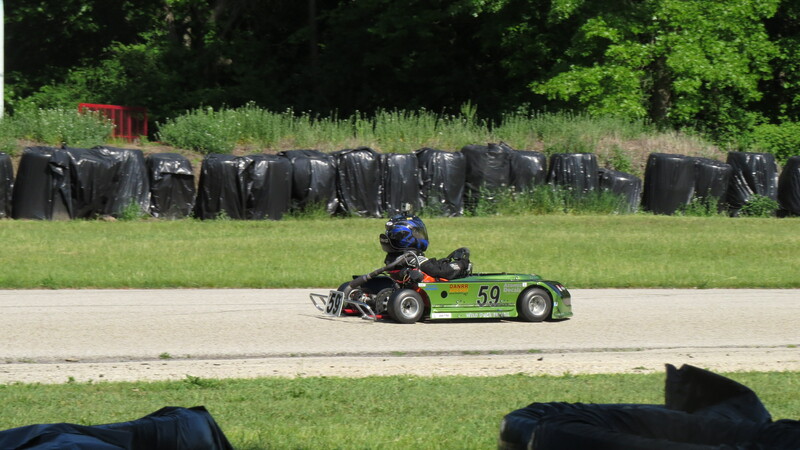 After that, we are planning to race at Road America Kart Club in a night race during that will take place during the June Sprints the weekend of June 12-14. If you are out there racing with the SCCA come on out and support the next generation of racers. First, I want to put out a heartfelt thanks to the safety crew at Blackhawk Farms. They did a great job of keeping things safe as possible and stepping up when things went wrong. The crew that picked up our racing comrade and flew him to the urgent care he needed. Dave Larsen and the CES crew to putting the great event on. The Vehrings at 4 Cycle Central for helping us keeping it together mechanically. This races sponsor The Greenwood Restaurant. And Karen, yes I know we drive you crazy with all this racing but it makes us both so happy.